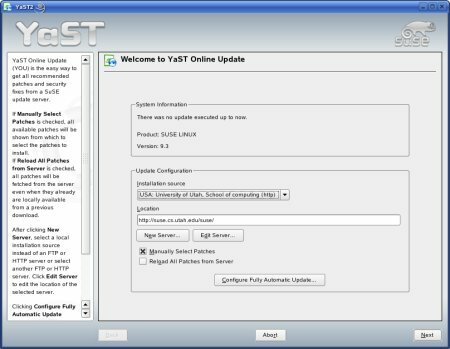 Note: The official method for updating SUSE LINUX Professional (SLPro) is using YaST Online Update (YOU). To launch YaST Online Update go to YaST2 > Software > YaST Online Update or click on the SUSE Watcher icon (located in system tray) shown in step 2. If you launched YaST Online Update though YaST2, then please skip to step 5, otherwise continue with step 2. The color that the YaST Online Update icon displays represents a specific status. If it is green then the system is up to date (relevant to when the last check for updates was performed). If it is yellow, you either have recommended update(s) to install or the system was unable to check for updates. If it is Red then security update(s) are available. 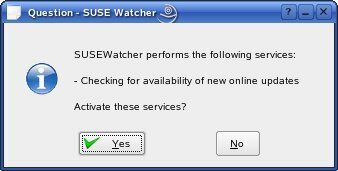 Once you have clicked on the SUSE Watcher icon, you should receive a prompt to activate the SUSE Watcher service(s). In the example it will check for the availability of new online updates. Click Yes. SUSE Watcher presents you with several options. The main two items are Check for updates and Start online update. Click on Check for updates. The YOU Status section will show that it is checking for updates. 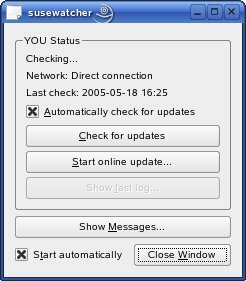 Once the check is performed, the YOU Status section will then display whether or not updates are available. You can also setup SUSE Watcher to Start automatically or to Automatically check for updates by clinking in the box next to those options. If there are updates available, start the update process by clicking the Start online update button. 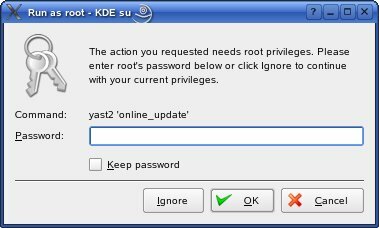 You will be prompted to login with root's password in order to access YaST Online Update. Once you put in roots password, click OK.
You should get a list of the mirrors that are closest to you. You can choose a different mirror by changing to a different installation source using the drop-down menu. If you want to manually select the packages to be installed, then verify that the Manually Select Patches option is checked. Click Next. Patches will show up in three different colors. Security patches show up in red text. Recommended patches show up in blue text. Optional patches show up in black text. Choose the appropriate packages and click Accept to install them.